Embroidered cushions have become my wedding present stalwarts and here are two I made for a couple about a year ago. Of course, it goes without saying to anyone who knows me that they were delivered a year after the wedding but at least the couple got them before the first baby arrived. I always try to make the 2 cushions different, yet related and hope that they appeal to the individuals. 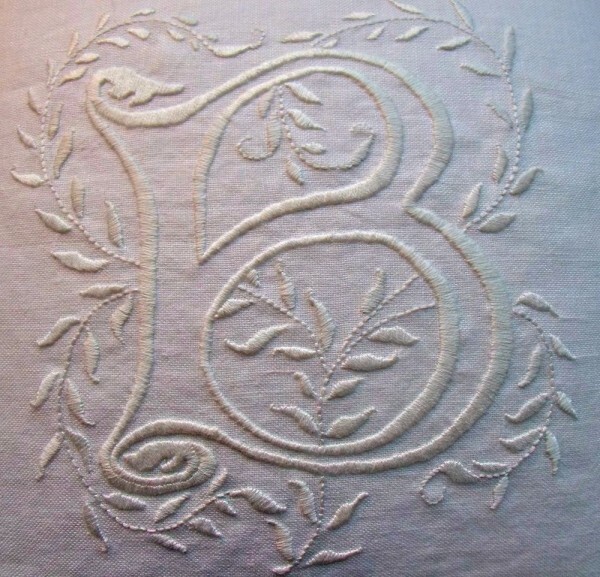 I probably did more than 10 sketches for the ‘B’ cushion, several along William Morris lines, with complicated interweaving of stems and leaves, but somehow I kept coming back to something much simpler as shown above. 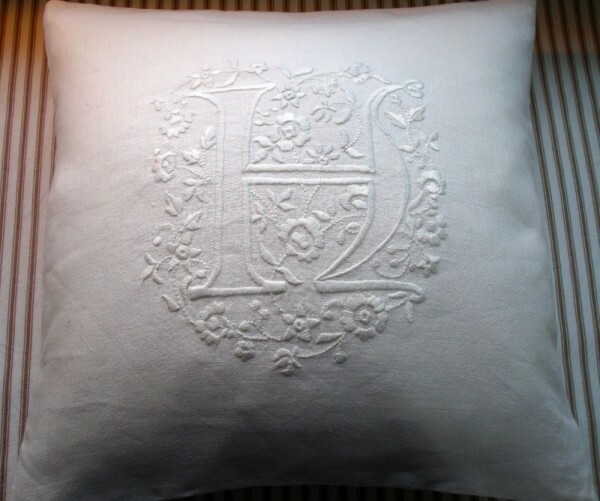 The letters H ad B are William Morris in style. 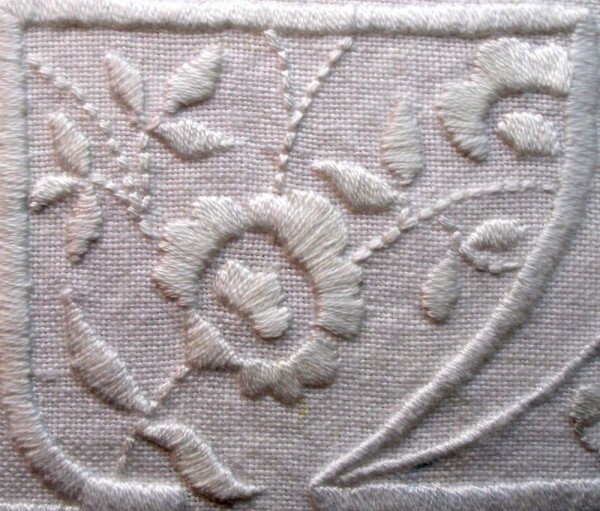 I often hum and ha about colour but usually go for white embroidery cotton on white linen which has the great merit of going with anything. I was brought up to call this sort of sewing ‘whitework’ but I was surprised to see that my needlework bible, “Encyclopedia of Needlework” by the fragrantly named Thérèse de Dillmont (produced as part of the DMC Library) has no patience with the term and prefers the longer “embroidery upon white materials” on the basis that nowadays we are more likely to embroider in coloured thread. 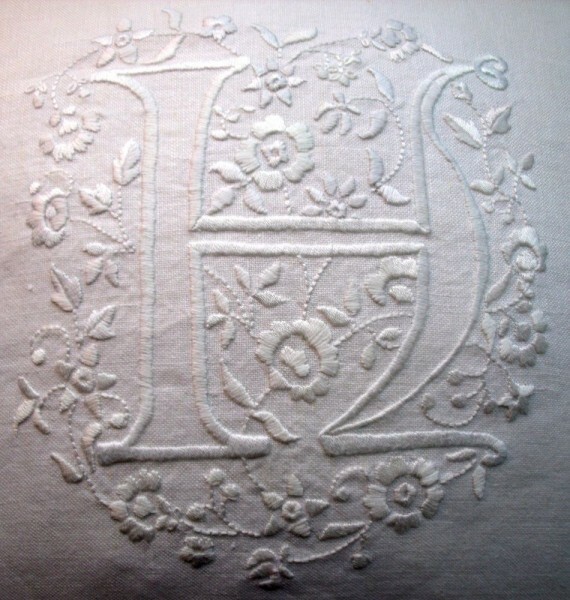 Well, that was more than 100 years ago and I think since then white on white has pushed itself right back into the forefront of fashion, so I shall continue to talk about whitework. Equally, I continue to love Madame de Dillmont’s book and suggest secondhand copies should be snapped up with joy. Measuring about 5 inches by 3 inches and about 1 & a half inches deep, it is a tiny treasure with lots of information and clear pictures and instuctions on all sorts of things from darning to tatting and macramé. I now know to have a notebook in my sewing basket in which I WRITE DOWN the details of the particular thread that I’m using. Even with daylight sewing lights it is IMPOSSIBLE to match the threads once daylight has gone. I have spent far too much time unpicking far too much stitching to ever trust visual identification alone. I made these cushions before neuroticism set in and I haven’t a clue which white I used. As the cushions (along with their owners) are now in Canada, I doubt I shall ever find out. 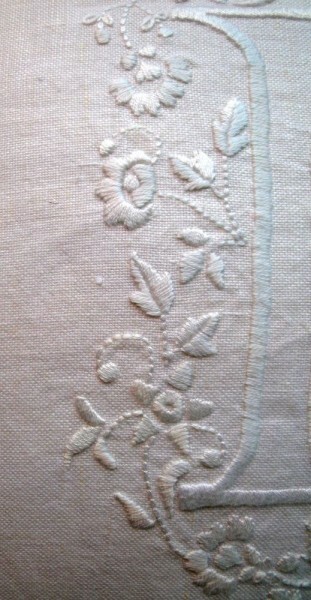 I also like to use Anchor Ecru & DMC 3866 (which is pretty much ecru) if the linen is on the unbleached side of white. Of course you can’t ‘dye’ anything white, you have to bleach colour out of it and this will only work on natural fibres, like cotton, linen or silk, but not wool. I have bleached very pale pink linen to white by adding half a cup of bleach to the soap dispenser of the washing machine, putting damp fabric (2 metres in this case) into the drum and running it on a cold cycle. After you take the fabric out, run a washing cycle again to clear out the last of the bleach and wipe round the rubber seal and door in a front loading machine. Too little bleach is better than too much which could cause the fabric to go yellow,or even start to disintegrate. In painting, artists have used highlights of white to great effect. John Constable produced enormous oil ‘sketches’ for his ‘six-footers’ (the big paintings which were exhibited at the Royal Academy’s summer exhibitions). These were painted quickly with sweeping swirling jiggled strokes and lots of white was used – much more than in the finished painting. It is said that those Impressionists who saw these sketches (and they were never meant to be seen) were stunned and regarded themselves as much in artistic debt to Constable as to Turner. And this is the 1830s. The first time the term Impressionist was used about a painting was 1877. So modern looking are some of Constable’s sketches that the catalogue for the Tate’s exhibition of 2006, Constable: The Great Landscapes, even says they, “have earned him the title ‘Jackson Pollock of the 1830s’ for the wild use of thick impasto and flecks of pure colour”. To go further into what painters make into white paint (and all the other colours) have a look at Victoria Finlay’s book ‘Colour’. A mixture of travelogue, detective stories and quests she goes all over the world to find the sources for the natural pigments in common use until the C19th. Many are highly poisonous and exemplify the idea that beauty often came with a heavy cost. Now we are all fully aware of the dangers of lead paint and since 1994 it can only be bought under special conditions, “Winsor and Newton say it is only ‘available in selected sizes, in selected countries, in childproof tins from either a locked display area or from behind the counter”. Titanium white is suggested instead. Victoria Finlay spoke to the porcelain hand painters at Spode in 2001 just 3 months after they were told they could no longer use lead-based paint and they quite literally rubbished the replacements which they criticised as not being, ” as vibrant and nothing near as sharp”. These artists would have been happy to use the lead based paint and acknowledged the risk involved. They took great care and had regular blood tests (so no chewing the end of the paint brush for inspiration). One of the team had just retired in full health after 52 years of painting, 5 days a week and others had been in the job for years. For them the end result was worth the small risk. Thank goodness thread isn’t anything like as dangerous. 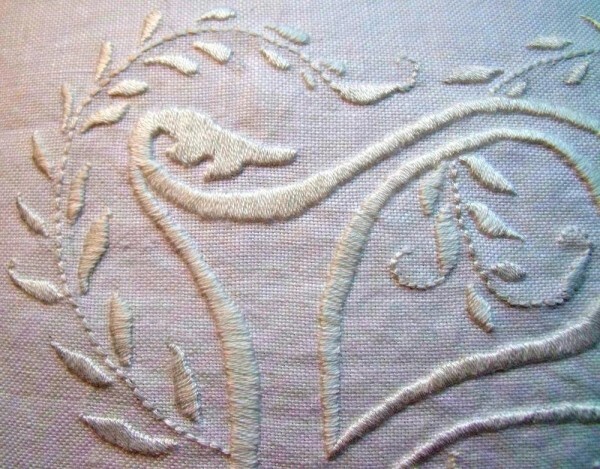 I would like two cushions for a my daughter and sons wedding . I would like an monograms of S & L over lapping each other and the date of their wedding and also one of S & S plus date of their wedding. Could you let me know if this is possible ad the price please . Christine, sorry not to have replied to you before. I would charge £150 each cushion and would require a £50 deposit for each. I would not be able to start until the beginning of February and each would take about a month, which includes time spent on the design. Handwork takes longer than people often realise, particularly as I work 3 days a week. If you wish to go ahead, we can exchange emails about the details. 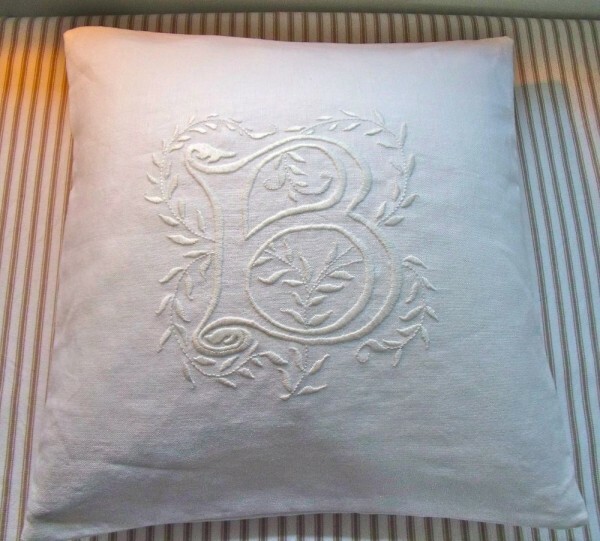 Could I get an ‘M’ embroidered on it instead of a ‘b’? and how much are they? and its just for a friend not a wedding, is that okay? Sorry not to have replied to you sooner. I would charge £150 for a cushion and would require £50 deposit. I may not be able to start for 6-8 weeks and a cushion would take about a month from design to making up. (I work 3 days a week and have other commitments at the weekends). Each is individually designed, hand embroidered and the finished item is unique. I’m pleased that you liked the cushions in the post. If you want to take it further we can discuss details by email.